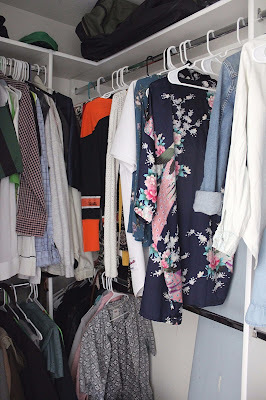 Like the garage make over and the pantry do-over, our master bedroom closet was nothing to complain about in terms of what the previous owners had provided us - but there was just something about the whole thing that didn't work! It's like there were already nice elements in there, but the functionality wasn't happening. Maybe we're just high maintenance humans? I don't know. But here's something funny: while I was uploading these "before" photos to my computer, I thought, "what was wrong with the original? If we had just organized a little bit more it probably would have helped our cause out a lot. Bahaha!" No but truly, when one would walk into the original layout, claustrophobia was at an all time high. Immediately to the left was a (albeit very nice) shelving unit, so you couldn't really lift your left arm to do anything. Then, because the built-in dresser and another shelving unit were to the right, the previous people had taken off the door because it would hit the drawers (both couldn't be open at the same time). This made it so every time I walked into the master bathroom, a world of clutter was staring me in the face (again, probably a little organization would have helped us out in this department hahaha). Lastly, the dowels and clothes-hanging areas really did all blend together in a mish-mash of ways - it was stressful going in there! Chad has an ungodly amount of clothes - he always has, probably always will. When we first got married, I was sorting through it all and couldn't believe the volume of winter clothes (UH WE LIVE IN CALIFORNIA - WINTER WEAR IS BASICALLY THE SAME AS SUMMER APPAREL BUT THERE WAS "WINTER WEAR" NONE THE LESS). It was hilarious and still is! 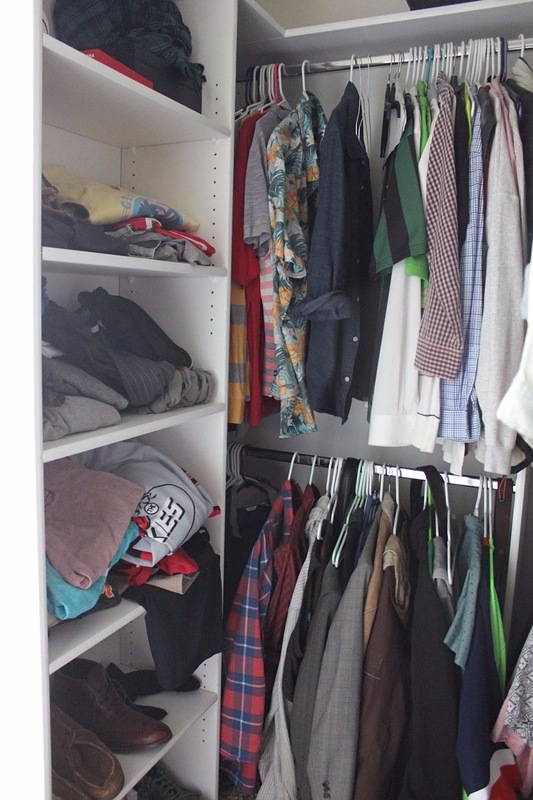 The man just has a ton of clothes. Oh and shoes? He's got a bunch of those too. I am glad though that he enjoys this stuff - at least he likes looking put together! 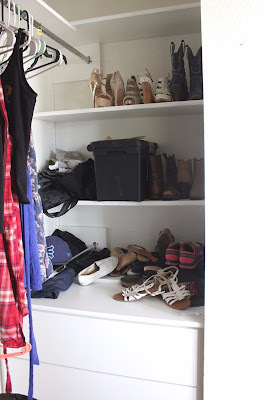 But anyhoo, all of those clothes and (large) shoes needed a place to go, so one day we just tore the whole closet apart on a whim. I COULDN'T TAKE IT ANYMORE! Once Chad lifted the built-ins, we found the original carpet underneath (which meant there were two types of carpet in the small walk-in - the original then what a past owner had put down on top of it). 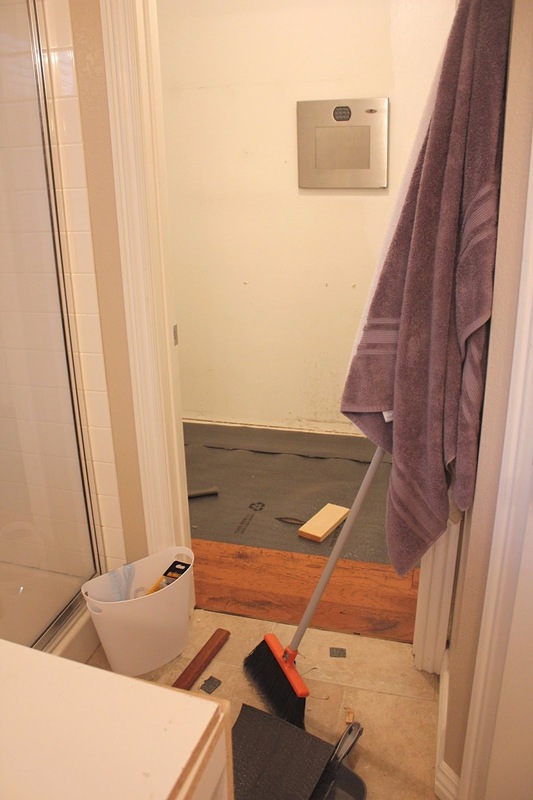 That discovery led to Chad tearing up all of the carpet - DIY YOU SLIPPERY SLOPE, YOU! I was secretly thrilled though. My man headed to the garage, accessed the leftover hardwood floors from the previous owner and then went to the Depot to spend $50 on that liner right there. This was his first go at laying down flooring - I'd say it was a MAJOR WIN. While it was empty and before the floors were fully laid, I gave the little room a coat of white paint - even the ceiling! It felt great! Then there was lots of finagling around! I'm so glad Chad has the gift of spacial relations. Honestly he always comes in clutch when we're trying to do these type things. He just has an eye for it all! He was the one who came up with the closet layout. One of the challenges was that legit-mo'-effin' safe built into the wall (installed by the previous owners). 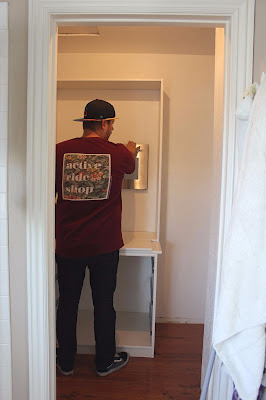 They were ADAMANT second amendment supporters, so they had these type things installed in several spots of the house (this is the only built-into-the-wall type safe, but several pieces of their furniture had electronic boxes screwed to them in hidden areas). So anyway, we had to figure out a layout that would accommodate for the safe. I plan on using that dowel that's hanging there above it as an outfit-planning type thing. Like "hang our clothes up for the week" area (and to hide it - it's not exactly the prettiest thing to look at. THIS WAS MY FAVORITE PART! Chad re-installed the door that had been stored in the garage up until this point. YES. It looks sooooo much better up there. We also installed those dresser pulls - the original plan was to DIY these leather loop pulls (I thought it would be a great masculine feature to the whole look), but straight up, those pulls looked SO BAD. So we took them off and screwed in a few dresser pulls we had lying around. It wasn't exactly what I had envisioned for the large dresser and I still don't LOVE them, but it works! Now here we are, months later, and the only other thing I've purchased for the space (which I'm too lazy to go up and take a picture of) is one of those $14 mirrors from target that you screw to the wall. It sounds soooooooo simple and underwhelming that I got THAT mirror, but gosh dangit this closet is now EXACTLY what I wanted out of the whole endeavor in the first place. I can now step inside the area, close the door and get changed in my - wait for it - CHANGING ROOM, not just closet (!!!!). Bahahaha! 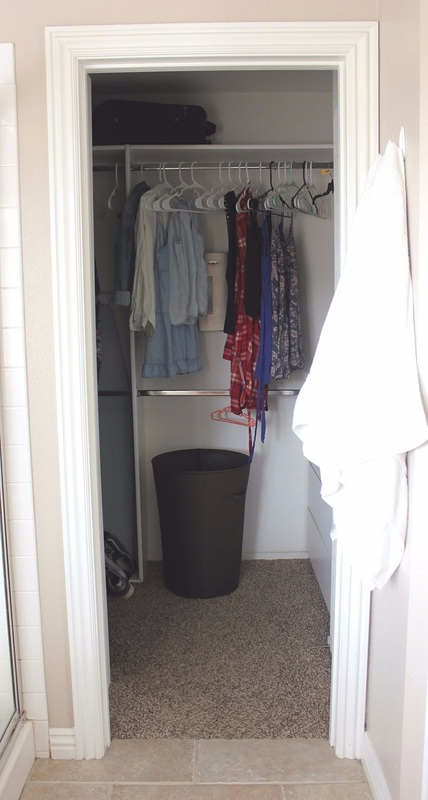 That's what I told Chad when we first started: "I want a changing room, my dear, not just an ordinary closet." This reason rested in the fact that Carter is a silent creeper of the house, and with him getting older, I didn't want him to silently creep into our room while I was stark naked getting dressed - SURELY THAT WOULD LEAD HIM TO BEING SCARRED FOR LIFE. So yes - WIN!!!! I love it, Chad loves it, and after months of actually USING it, functionally it's very on point. YAY!!!! Your room is หน beautiful. I love watching renovation post! Thank you for sharing the post!